This will shake your beleifs to the core…in a cheerful way. I always suspected that he’d return as a different person, but I expected a black bisexual transsexual. I know the whole thing about women’s rights but this is pushing it. and what a pretty girl you are, Jesus! …Jesus Christ the lunchbox, Jesus Christ the sports drink, and finally, Jesus Christ the Doll. Born to the Virgin Mario and his wife, Josephina. Associated with the gigolo, Mario Magdalene. 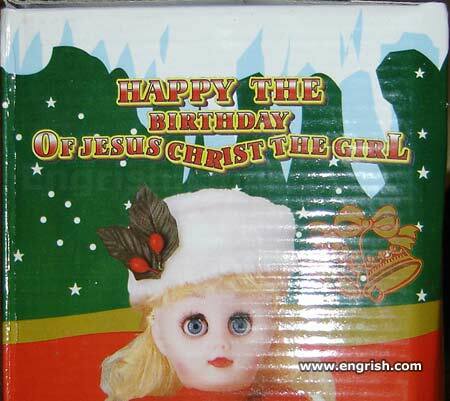 This must be the Anti-Christ Doll … the perfect Christmas gift. Mr. Chang, Design Manager: What? Jesus is not the same person as Santa Claus? And he’s not a girl? How dare the Foreign Devils say that OUR beliefs are complex?! Happy the Birthday, Jesus Christina!